Recovering with a stiff G & T after Roland and That Woman had left, I comtemplated the dilemma of the summer dress or top with a Linguine strap. Personally the minimum width strap I would consider is the Lasagne (talking of pasta I can recommend the Manicotti [man-a-cottee] (“Small Muffs”) one of Ronalds favourites. Stuffed with a mixture of meat, cheese and vegetables, topped with your favourite sauce and baked in the oven, or stuff and freeze for a lunch with your lady friends. I digress back to the exposed tops of arms and shoulders. Why is it that even though in the UK the majority of ladies are size 16 and above and over 50; manufacturers still insist on making dresses with Angel hair straps and too short? Now I am sure you will agree I am abreast of the latest trends and fashions but I retrocede to our Icons; Audrey, Vanessa and Dianna. They discovered the style that suited them and stuck to it with the odd nod to current trends. This is what we should all apprehend for ourselves. One of the classic but wearable solutions is a wrap or shawl. I prefer to call it a wrap which sounds like a present exciting to unwrap; rather than a shawl which sounds as if it came out of a Catherine Cookson novel. Now ladies I know some of you have yet to pick up kneedles and wool but I urge you to give it a try. It is the most relaxing, satisfying occupation and it is like the Martini advertisement something you can do anytime, anyplace, anywhere. 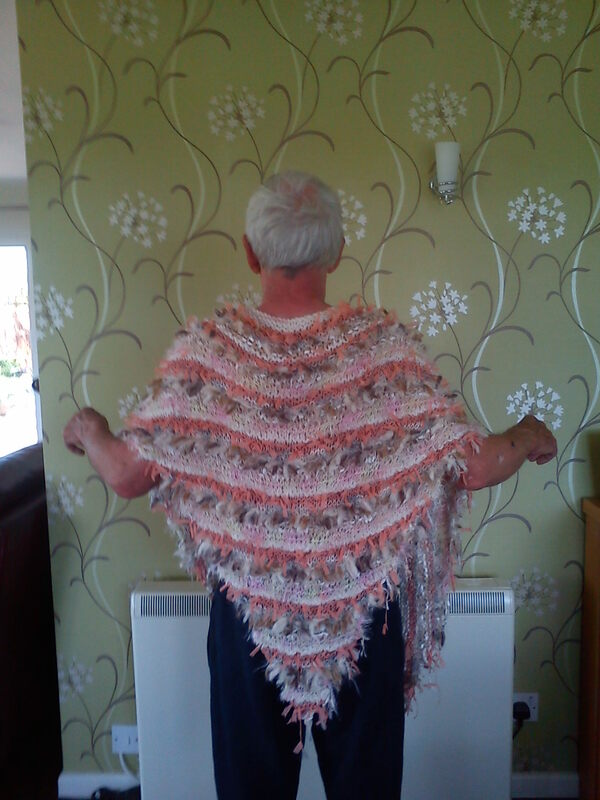 One of the simplest items to knit as a beginner is a wrap or shawl, which can be knitted in any type of wool. Choose something soft and a colour that will go with your summer wardobe, don’t worry about thickness just pick something that takes your fancy. On the label you will find the size of needle to knit with but again do not worry to much if you have a slightly different size. A larger needle will create a lacy effect, a smaller needle a tighter weave. Start by casting on two stiches, knit a row. Then knit every row but increase a stitch at the beginning and end of every row. When it is big enough, cast off. You will end up with a large triangular wrap. So come along ladies pick up those needles, knit a wrap and cover those shoulders and bingo wings.